Huawei is another company looking to get in on the growing popularity of Windows 10 hybrid tablets. The company best-known for its smartphones has introduced a tablet-hybrid device with a high-end design. It's another option in the quickly expanding market of detachable tablets, and it's aimed at competing with the likes of the iPad Pro and Surface Pro 4. But does theHuawei Matebook stack up for business use or is it just another mid-range tablet with a sleek design and a keyboard stand? You will not be disappointed with the design of the Matebook. Its aluminum chassis resembles the iPad Pro's smooth, rounded edges and the keyboard folio-case is reminiscent of the Samsung Galaxy TabPro S. It screams quality design. You won't find any plastic parts in this attractive device. It's also small and lightweight, measuring just .27-inches thick and weighing in at 1.5 pounds. You certainly won't have any trouble toting this device back and forth from work or on carrying it on the road when travelling. The device doesn't have any physical buttons other than the volume and power buttons. You won't find any tactic-feedback buttons on this bezel. It does come equipped with a fingerprint scanner built into the right side of the device, which gives you a way to quickly unlock your device without typing in a pin or password. The device doesn't come with as many ports as the Surface Pro 4 -- you'll just find the USB Type-C port, which also charges the device, and a headphone jack. 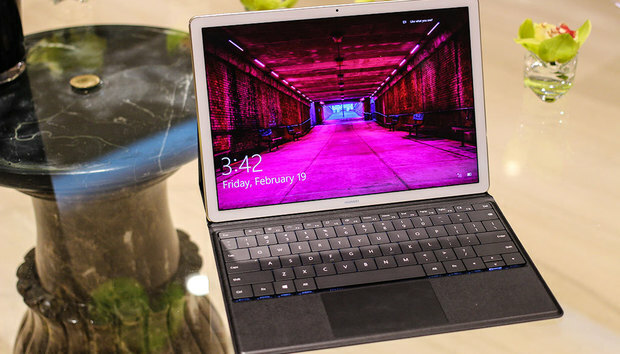 It's the same ports you'll get on the iPad Pro and Galaxy Tab Pro S.
The Huawei Matebook features a 12-inch full HD touchscreen display, designed to be used in landscape mode, much like the Surface Pro 4. With a 216 ppi resolution, the Matebook offers a clear and crisp display; the glossy display does cause for some glare in certain lighting, but you'll find that with the iPad Pro and Surface Pro 4 as well. Technically -- in terms of pixels -- the display isn't as good as the iPad Pro, but these days that's really splitting hairs. You'd have to look hard to tell the difference in display quality between the Surface Pro 4, iPad Pro and Huawei Matebook. If what you want is a Windows 10 device that you'll mostly use to stream shows and watch movies on, the Huawei Matebook display will not disappoint. You have a few options when it comes to choosing which configuration of the Matebook you would like to purchase. It can be equipped with either an Intel Core m3 or m5 processor, with a choice of 4GB of RAM and a 128GB SSD drive, or 8GB of RAM with a choice of a 256 GB SSD or 512 GB SSD. While not on par with the vast configurations you'll find with the Surface Pro 4, it does offer more configurations than either the iPad Pro or Galaxy TabPro S.
Overall, either configuration should be just enough power for the typical user. You won't have much issue using Microsoft Office, apps, web browsing and streaming. You might not find it the right tool for using taxing software or even photo or video editing software, but anyone looking for that in a device is likely looking at a higher-powered device to begin with. For the average user, who just wants to browse the web and use the Microsoft Office Suite, the Matebook packs just enough juice to get your work done. In testing, the device did experience some lag when opening applications, especially if there were already quite a few open. It's inevitable, considering it's a mobile processor on a tablet, which means, if you've used a traditional notebook with an Intel m3 or m5, you shouldn't expect the same level of performance on such a slim tablet, so avoid comparing the two. Overall, it's not the greatest performance, but it's not so bad that you'll be dreaming of chucking the device out the nearest window. Huawei claims a nine-hour battery life with typical use and video streaming, and a 29-hour battery life if you're just playing music. While music playback is an odd way to measure battery life, it's good news if you're a DJ or like to use your tablet as an entertainment device. One of the biggest accessories of any hybrid tablet is the keyboard and while a keyboard might seem like a small feature on a typical notebook, it's a big deal for a hybrid. Since keyboards also act as the base of hybrid tablets, it's important that you're comfortable with the overall design and function. The keyboard on the Huawei Matebook is similar to that on the Samsung TabPro S. It's a portfolio design that folds out to also act as a support for the device. However, it has only one or two available viewing angles, which can quickly get annoying if you're expecting to use this device on a plane or while you're riding the train to work. These types of keyboard-folios work great on a desk or any other solid surface, but they fail to impress if you're using the device on your lap or in a cramped space. And the Matebook felt especially flimsy, more so than either the Surface TabPro S or iPad Pro, which feature somewhat similar keyboard designs. It's far too easy for the Matebook display to tip over and fall backwards, which is not only frustrating, but could easily leave you with a shattered tablet display. The key feedback on the actual keyboard itself isn't great. The keys are set pretty close together which doesn't make for a comfortable typing experience. The trackpad, on the other hand, is highly responsive and was enjoyable to use. But the biggest dig on the keyboard is the fact that it's sold separately for an additional $129 and while the same can be said for the iPad Pro or Surface Pro 4, it's likely consumers will opt for one of those options over the Huawei when it comes down to price and performance. It's hard to imagine a business scenario where anyone would be comfortable with having just one port on their device, especially if it's the same port used to charge the device. But Huawei has an answer for this in the form of a docking station which expands the USB Type-C port to include an Ethernet port, two USB 3.0 ports, an HDMI port and a VGA adapter. Of course, it's something to consider that this is just another accessory you'll need to tote around with you -- and remember to pack -- if you want that type of expandability in your device. You can also opt to purchase a stylus pen for this device, but like with the iPad Pro and Surface Pro 4 it's only a necessary accessory if you have a need for signing documents, annotating PDFs and prefer taking handwritten notes. It's not as finely tuned or as thoughtfully designed as the Surface Pro 4, but it will be enough to sign documents and jot down a few quick notes. Huawei didn't spare anything when it comes to the design of this tablet, but it's mid-range guts don't exactly match its high-end looks. It's a great stab at a first device, but when you consider the base price of the device at $699, when you start adding on the stylus, keyboard and docking station, you might as well start looking at the iPad Pro or Surface Pro 4 instead. The Huawei Matebook Intel Core m5 with 8GB of RAM and a 512 GB SSD will cost you $1,199 without the keyboard. For the same price, you can get the Surface Pro 4 with an Intel Core i5 processor, 8GB of RAM and 256 GB of storage and the additional keyboard. It seems hard to rationalize opting for a mobile processor and a device without a keyboard when you can get a similar device with a Core i5 processor and still have money left over for the additional keyboard. And when it comes to the keyboard stand, the Matebook has the worst keyboard-dock experience when compared to the iPad Pro, Surface Pro 4 or Samsung Tab Pro S. Unfortunately, since the keyboard is one of the defining features of any tablet-hybrid device, it's hard to recommend this tablet as a business device since the design will likely get in the way of productivity. The Matebook is a great first attempt at a high-end hybrid device, and if the next iteration brings an improved keyboard, a better docking system and just slightly better performance, it could have a shot at becoming the next enterprise-darling. What must change before 'voice-first' hits the enterprise?